The Carolina Hurricanes struggled to beat Montreal goaltender Carey Price for 54 minutes. Price turned away shot after shot, to the point that even Hurricanes coach Rod Brind’Amour thought there was no way his team was going to find the net. Andrei Svechnikov scored with 1:45 left in overtime as the Hurricanes rallied to beat the Canadiens 2-1 in a matchup with Eastern Conference playoff implications. Carolina's Trevor van Riemsdyk scored the tying goal with 5:39 remaining, and Svechnikov ended it with a wrist shot through Price's legs in the extra session. After Price stopped Carolina's first 36 shots, he allowed two goals on the final four shots he faced. "It didn't look like it was going to happen," Brind'Amour said. "You're hoping for one or two or three Grade-A chances in the third and we had more than that. So it was like, if those aren't going in, what's going to go in?" What went in was van Riemsdyk's wrist shot from the point through traffic that clipped the skate of Montreal defenceman Jordie Benn and found the bottom left corner of the net. It was a critical goal from an improbable source in van Riemsdyk, who scored for just the third time this season. "Obviously you know you're playing one of the best goalies in the world, if not the best goalie in the world, so it's going to take some something a little uglier to beat him," van Riemsdyk said. "You just gotta stick with it. You can't get frustrated. We just kept trudging away." After jumping off the bench on a line change in overtime, Svechnikov took a pass from Jordan Staal, skated down the right side and whipped the puck through Price's legs to end it. "We're disappointed, we came here to win," Canadiens coach Claude Julien said. "We needed to protect the house and they ruined it pretty good there." Curtis McElhinney stopped 28 shots for Carolina, which has won six of eight. With the win, the Hurricanes remained alone in the first wild card spot in the Eastern Conference. 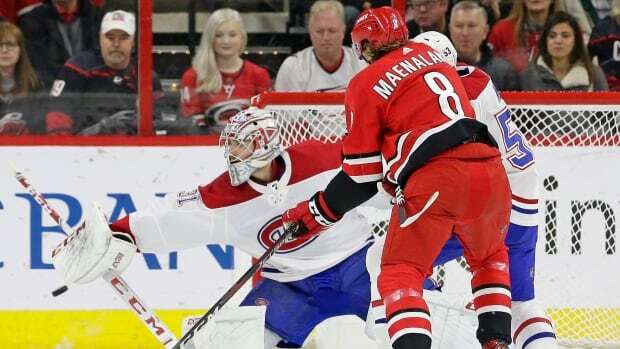 Montreal squandered a chance to move into a tie with Carolina with a win. Paul Byron scored in the first period as Montreal had its three-game winning streak snapped. The Canadiens had plenty of chances. They got the scoring started when Brendan Gallagher fired a shot from the left faceoff circle that was deflected by Teuvo Teravainen. But the rolling puck went straight to Byron along the far post, and he buried it. The Canadiens had other opportunities, too. Jeff Petry hit the post in the first period, and in the second, Tomas Tatar also hit a post. Jesperi Kotkaniemi had a breakaway denied by McElhinney and Nate Thompson's point-blank shot in the crease after a turnover was stuffed by McElhinney, as well. "[McEhinney] just played an unbelievable game," Svechnikov said. "He kept us in that game, for sure." "There's no nerves to his game and it settles our group down," Brind'Amour said. "You can't say enough good things. He went toe-to-toe with the best goalie in the world and he certainly didn't take a back seat."